Click on vignette to diplay the calendar half-year 2018. See also: All calendars photos 2018. 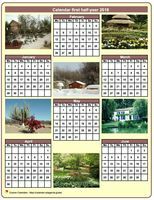 With this calendar 2018 half-year from December till June and from July till January, you get a fourteen-month calendar for double-sided printing. This calendar 2018 half-year from December till June and from July till January shows a different photo every month. 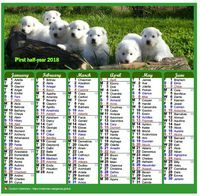 Calendar 2018 half-year in column with a different photo every month. Customise the layout of the calendar 2018 (dimensions, colors, alignment, police), via tabs 'Calendar', 'Month' and 'Boxes' (2). 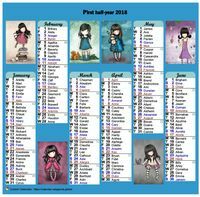 Calendar 2018 to print, half-year, tiny pocket format, white background. You will be able to customise the layout of the calendar 2018 (dimensions, colors, alignment, police, borders), via tabs 'Calendar', 'Month' and 'Boxes' (2). 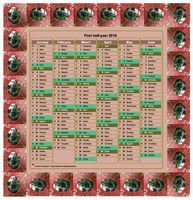 Calendar 2018 to print, half-year, tiny pocket format, green background. You will be able to customise the layout of the calendar 2018 (size of boxes, background color and boxes, alignment, police), via tabs 'Calendar', 'Month' and 'Boxes' (2). This coloring calendar 2018 will allow children to become familiar with the time: days, months, half-year and years. You will be able to customise the layout of the calendar 2018 (dimensions, colors, alignment, police), via tabs 'Calendar', 'Month' and 'Boxes' (2). You will be able to customise the layout of the calendar 2018 (dimensions, margins, colors, alignment, police), via tabs 'Calendar', 'Month' and 'Boxes' (2). Calendar 2018 half-year with a different photo every month. To change the background color of the 2018 half-year calendar, click on the 'Calendar' tab. 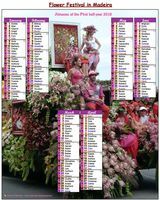 To display or not display the names of saints in the 2018 half-year calendar, click on the 'Data' tab. You can even display two, three, or four saints a day. 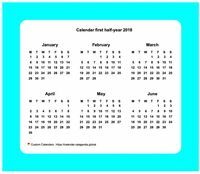 Each sample 2018 half-year calendar proposed above is built from a template. All calendar templates are customizable.